Corby’s workforce includes one of the largest pools of logistics and warehousing staff in the county, evidenced by the success of a significant number of major distribution operations based in and around the town. The town continues to grow as its economy goes from strength to strength. 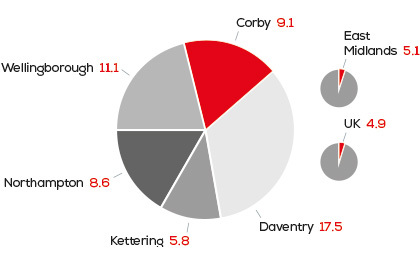 Corby’s population grew by 14.5% between 2001 and 2011 – double the regional average. 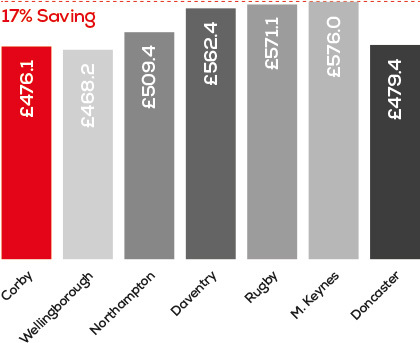 And this growth is set to continue, with North Northamptonshire setting a strategic house building target of 33,851 by 2021 to meet expected demand. Analysis of the 30 minute drive time catchment around MLP shows over 13,000 logistics workers and over 14,000 unemployed. So recruiting 500 warehouse workers would represent less than 4% of locally available logistics workers and unemployed. Such is the importance of logistics to the area that Northampton and Tresham Colleges offer Warehousing and Distribution apprenticeships, and Northampton College has a specialist academy to train the next generation of workers in the industry.